Summer is fast approaching and most of us already has a plan for the upcoming season. Others might be still in the process of planning while others probably just starting. As for my family and I, we have no plans at all, hehehehe.. I mean we don't need to travel into the wilderness or find some kind of cabin in the middle of nowhere, in which we can find them all outside our house. I don't mean that we live in the middle of nowhere, just the property we are and this is in a good way. Camping with your family is so much fun, especially when you wish to take your kids into knowing the world without electronics. Listen to what the nature has and such. The product arrived in the mail via UPS. I see no signs of damage in the product that I was able to opened it and check it right away. · HIGH QUALITY: Made of anodized aluminum material, earth friendly and non-toxic. · EASY TO WASH: This cooking set is a kind of non-stick cookware, easy to wash.
· EASY TO CARRY: Small size(Suitable for: 1-2 people). Foldable handles on pot, frying pan and soup spoon, it can be folded to save space. All the objects in this cooking set can be stored together in a mesh bag for convenient carry. 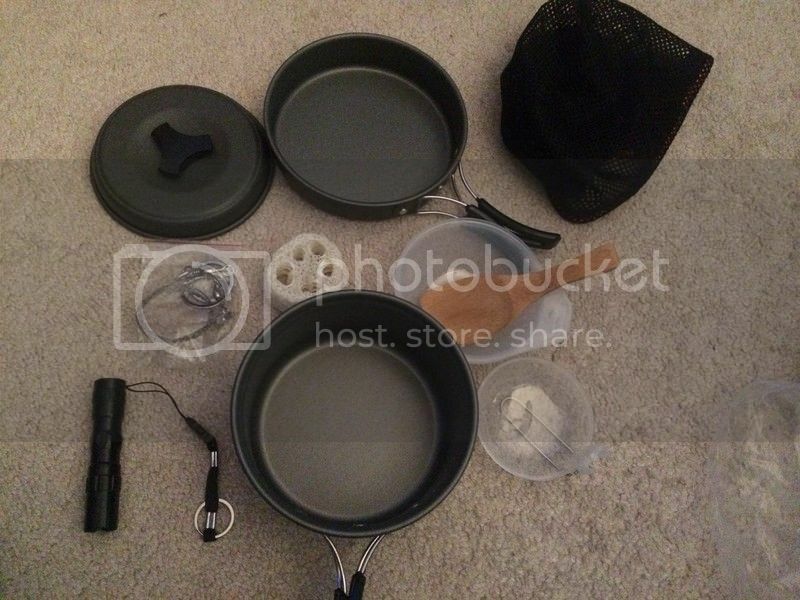 · 2 FREE GIFTS: Buy 1 Wolfyok(TM) Cooking Ware set get 2 outdoor accessories for free: Stainless Steel Wire saw and Waterproof Super Bright Flashlight, is perfect for camping, backpacking, hiking, emergency preparedness, or as part of a survival kit. · 100% GUARANTEE: 100% money-back guarantee. This product is amazing. I received all the kits that are included in the product. The cookware set very light. I like the bowls that comes with it also, easy to use for something during camping. The small spatula is also handy as well as the sponge that comes with it. I love the flashlight. Very handy, slim and when you turn it on it gives you a super bright light. And only takes 1 AA battery. I have noticed that the holder of each cookware seems to be wobbly. I just hope it won't be a problem once I have used them this Summer. The cookware seems to be durable and made of a high quality material. Easy to carry because it is lightweight and I also love the 2 free gifts that comes along with the item. I like the bag that comes with it too, in which it would keep everything in one set. The lid fits the small pot perfectly. I see no dents, scratch and the coating of the cookware are excellent. Though, the product did not come with an informational guide, I would say it is pretty much common sense on how to use the sets. I would recommend the product to those who seek for a nice outdoor camping, cooking set as it is worth the money you pay. Awesome, Thanks for sharing. Recently I bought this Powerful Mini Flashlight, looks great and can also adjust the focus range for different usage, Strobe light option for flashing Emergency Signal. http://patriotdeal.com/collections/all/products/powerful-mini-flashlight Usethis code "PD10"and save 10%.